Goa Shipyard Limited Recruitment 2017 – Apply Now for 149 vacancies in Goa Shipyard Limited before 15th May. Check detailed Notification here. Goa Shipyard has announced fresh vacancies. The last date to apply for Goa Shipyard limited is 15th May 2017. GSL is recruiting for a number of vacancies for a number of posts. Goa Shipyard is a government undertaking and comes under the Ministry of Defence. Working at the Goa Shipyard gives you a chance to serve the country, being in the defence sector. There are 149 vacancies at Goa Shipyard. Eligibility Critera: The vacancies have a upper age limit of 33 years. Educational Qualification: There are different posts and educational qualification varies according to posts. Applications shall be screened and candidates will be shortlisted after screening process based on educational qualifications and work experience. Pay Scale – Goa Shipyard Limited Recruitment. The pay scale varies from post to post and pay scale will vary according to post that people are applying for. 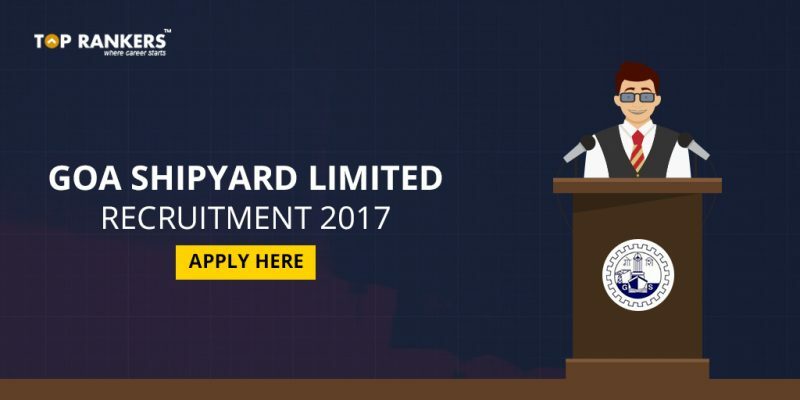 How to apply for Goa Shipyard Limited Recruitment 2017?